On February 7th, @pubnt faxed a letter to the judge in the Ellora’s Cave vs. Dear Author case. Courtney Milan has a long blog post about it, so I thought I’d take a different tack on the issue. 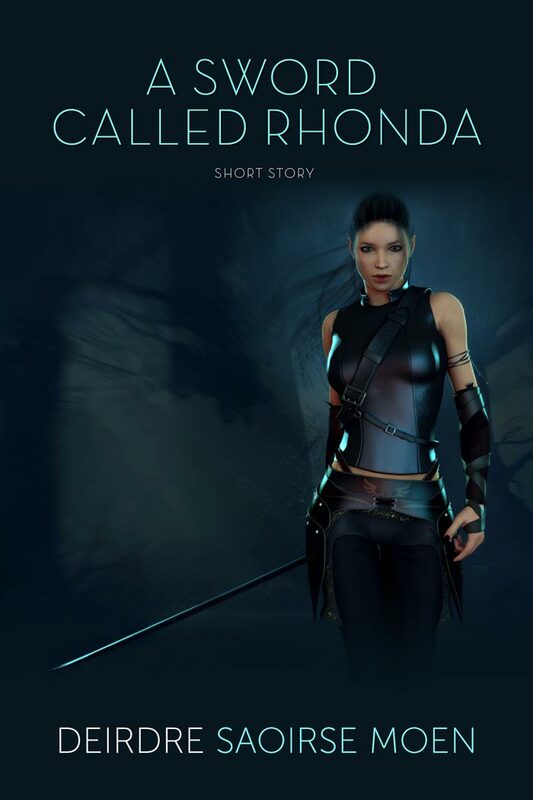 On October 4, 2014, Tina Engler, writing as Jaid Black, posted a blog entry titled _To the Silenced Victims_, about how Ellora’s Cave’s authors and supporters were purportedly afraid to speak up. 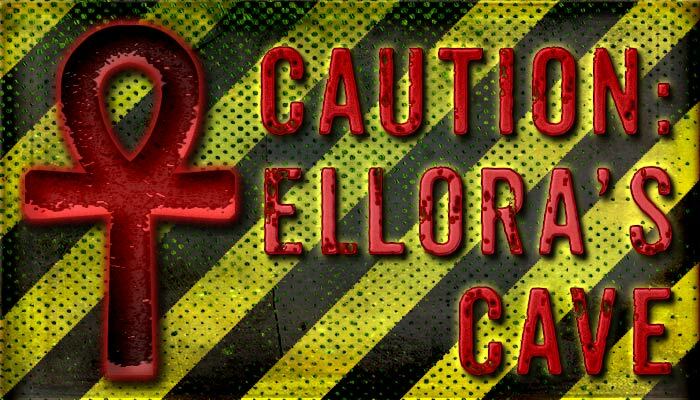 @jaidblack @ReeCroteau Some of the concerns have been: 1) No promotion on @ellorascave for authors since 8/11 & 2) promoting STGRB instead. For those who don’t know, the short version of StGRB is that it is not an anti-bullying group, but is a group of authors who bullied reviewers because of reviews the authors didn’t like. In other words, it’s ironically named. Giving a one-star review to a book you genuinely didn’t like isn’t bullying. I stated that the biggest problem with Ellora’s Cave’s tweets wasn’t so much the STGRB mention as failing to promote EC’s authors and books. I mean, it’s a Twitter account for a publisher that had new books published during those two months of radio silence. EC fixed that promotional shortcoming, and has remained focused on prompt tweeting of new releases, pretty much (I noticed a short blip, but didn’t record when, and I’m not interested in looking it up). 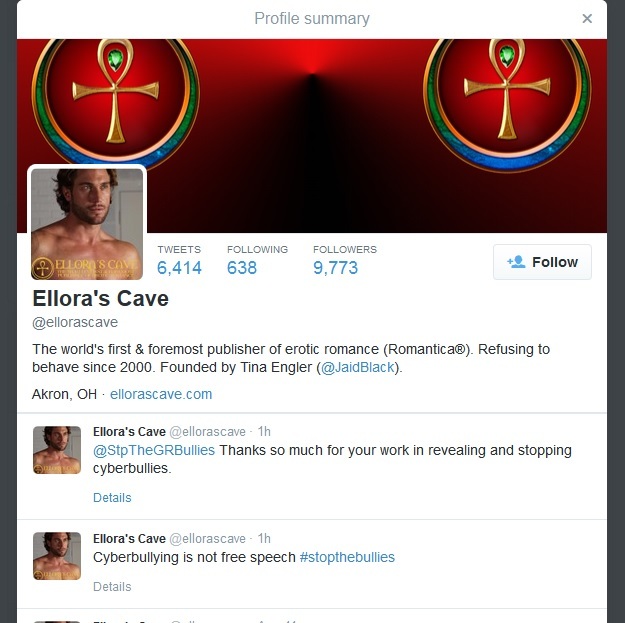 Oh, and also, Ellora’s Cave deleted one of those two tweets, the one that invoked STGRB. Why bother with this digression? Please hold…. What’s interesting about @pubnt’s tweets from the October 4th creation of the account until February 1 is that there are zero tweets for: “STGRB”, “goodreads”, “bully”, or “bullies”. And yet, in her letter to the court, @pubnt relies heavily on STGRB rhetoric. Also, STGRB are in fact the only links in @pubnt’s letter. What amuses me the most of all about @pubnt’s letter is the assertion that @pubnt is presenting evidence. STGRB isn’t evidence, it’s hearsay. Of course, if that’s how strongly TE feels about STGRB, she could have seen to it that the principal STGRBers were on EC’s witness list. But Ellora’s Cave didn’t choose to add said writers to their initial disclosures. As a general rule, anything said by anyone outside the list of people who make formal statements admitted into evidence or who are witnesses in the case—that’s hearsay as far as the case is concerned. Remember the pocket universe episode of Star Trek: The Next Generation? Legal cases are kind of like that. Apart from the witnesses and people giving testimony (and the law including case law, of course), the world outside is invisible. Or, more accurately, hearsay, with some notable exceptions. Invoking some random blog, even this one, is neither evidence nor proof. I’d like to refute the generalizations @pubnt makes about #notchilled regulars, at least as they pertain to me. I have never met Jane Litte. I have followed the Dear Author twitter accounts because Jane Litte and others recommend books I’d like to read. I often disagree with JL’s ratings. As a specific example, one of my favorite books last year was Laurelin Paige’s Fixed Trilogy. JL gave the first book a C- rating. I agree that the first is the weakest of the three, but the plot twists in volumes two and three made it one of my favorites, and book one was strong enough for me to continue reading. Apparently not for JL, and that is her choice. I make a horrible minion. I will only do what I think is right, and, even then, I don’t have time (or energy) to do all of that. In Gretchen Rubin’s four tendencies, I’m a rebel with questioner tendencies, so I’m perfectly fine with not fitting in and not going along with a crowd. I have made far more money from being traditionally published than being self published. I have books published by Que, Sams, Baen, and BenBella, plus others under pseudonyms. (If you follow the purchase/sale trail of the first three, you’ll see that means I’ve been Big5 published by two different routes: Sams and Que became part of Simon & Schuster, and some of the work I did for Macmillan Computer Publishing meant I’ve been published by Holtzbrinck.) I’ve never been published in the romance genre, and I’ve only been rejected once in that genre—more than twenty years ago. Frankly, it was a horrible proposal for a category book, but I was still too green to know that. I am working on a romance novel, and I have an agent who’s already been promised first look. That said, of course I’ve been rejected, too. It’s a part of being an author. Though sometimes rejections sting (and I do whine about those privately), I also get over them. As a friend of mine says, the right attitude to take to these if they’re getting to you: “That’s one more time an editor tried to stop me and failed.” (Neither of us believe this viewpoint, btw, it’s just that it’s one that happens to work for both of us to help get us back to the salt mines of writing new stuff.) I don’t dislike anyone who’s rejected my work—except perhaps MZB, but that’s for reasons unrelated to her authorial or editorial work, at least as it relates to me. I am not “jealous” of any successful writers, nor am I envious of them. I also understand the difference between these two words. I don’t accept advertising on deirdre.net, and never have. That said, I make a small amount of money every now and then from Amazon’s Associate program. How small? I haven’t received anything since 2011, and they’ve owed me $16.28 since 2005. Which I didn’t know until I logged in for this screencap. Essentially, I removed all the Amazon links I had after LGBT fail and have never really managed to build up the associate income stream I used to have, small though it was. That said, I have been considering what kinds of banner ads I might have, but generally those would not be paid ads. 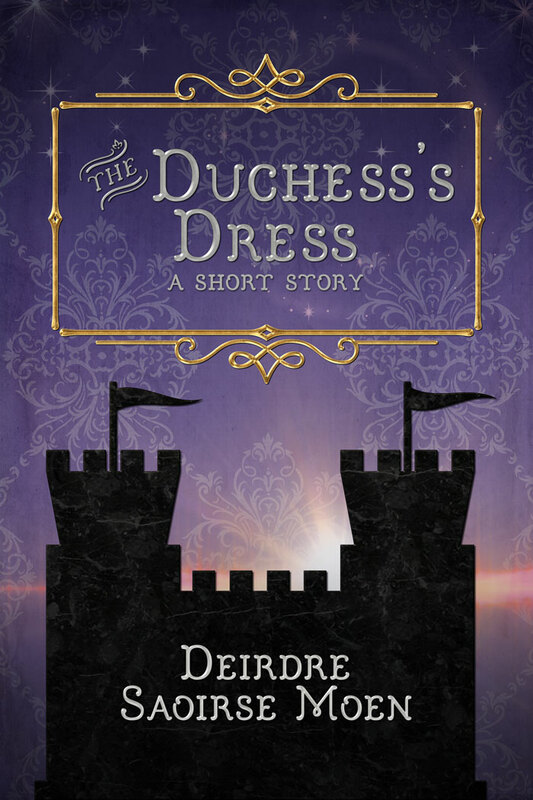 Like: I’d make a banner ad for my own new book, which makes sense, right? But how about if a close friend releases one that I liked? How about if my writing group did one? Should I promote Clarion (a workshop I did) via ad? If so, what are my guidelines about where I’d put those vs. where/why I wouldn’t? I don’t have those answers yet. Until I do: only inline contextual links. I have a few other kinds of promotional links here and there, but none are specifically targeting indie authors unless it happens to be a book I’ve enjoyed. One of the reasons I don’t generally review books is that I would feel compelled to be honest about books I didn’t like, and I feel that’s a problem as an author. Sometimes my reasons for disliking books have to do with various artistic goals I’ve got as a writer. For example, I stopped reading Neal Stephenson because his endings didn’t satisfy me. As a plot structure person, that’s a killer for a book for me. Clearly, many readers don’t share this perspective, and I’m glad he writes books they can enjoy. The guideline I’ve decided to follow is that I’ll promote books I genuinely love. Period. The Ellora’s Cave Author Exodus Support Thread is located here. Many EC authors have books out from other publishers. The purpose of the support thread is to help give those authors willing to speak out some visibility. An earlier version of this post was supposed to be published over the weekend. Apparently several posts I thought I’d scheduled didn’t post. Oops. Haha. For me, I felt it explained why I had such difficulty with motivation, and it helped me learn to be kinder to myself. I have corrected the PNut several times when it lumped me in with the so-called slush pilers. Highly ironic to consider that a fitting insult; anyway, when EC’s entire existence is owed to the fact that Tina Engler’s couldn’t get an agent or a publishing contract. I am neither writer, reviewer or blogger but pNut’s tiny pea size brain can’t comprehend that attacking the customer is unlikely to either silence legitimate criticism or improve the bottom line. I guess we will just have to add the concepts of rules of evidence & hearsay to the very loooong list of legal concepts that PNut can’t wrap its mind around. Perhaps they should sit down and have a frank conversation with an actual attorney, not the imaginary one they play on Twitter. It always irritates me when she does that to you, because you’d think Ellora’s Cave would actually, you know, like to have readers. So you understand the difference between jealous and envious, but, do you understand the difference between ‘could’ and ‘couldn’t’? Because in a twitter exchange between TE and Courtney Milan, the former clearly doesn’t. And let us keep in mind, TE is both an author and a publisher. I used to use phrases like “could care less” too, but I broke that habit long before my writing education per se. That whole exchange is O.o. TE has been publishing as JB since the late 90s. One would hope that someone, at some point, in all that time, had been kind enough to point out that she’s saying the opposite of what she means to say. In fact, I would be astonished if no one has told her that. Therefore, I have to conclude that either she is incapable of understanding/learning, or she has decided that the rules do not apply to her. Which brings me back to the identity of our dear legume. I care about language. It doesn’t mean I care about every argument, but I try to be careful about nuance. Now…most Americans would think nothing of that word. In fact, my husband, who’s really good at history and nuance, didn’t know the word was of Indian origin. It refers to the low cast Paraiyar caste in Southern India. I learned that as a teen studying yoga because one of the members of our group was of the Paraiyar caste and objected to someone throwing the term pariah around one day. It stuck. Besides, I think there are clearer words and phrases that convey the modern American usage without invoking the baggage of the word pariah. But, there you go, TE/JB/MM not being sensitive to nuance. Or respectful of other cultures. Well, she already appropriated an Indian World Heritage Site, so why the hell not dump on more brown people? One of the things that burns me about this is that if you search on phrases relating to Ellora caves, you get mostly this low-rent publisher, and not the amazing architecture of the caves. Hopefully the google hits will go the way of the dodo once EC’s gone belly up. I’d already decided that I will be punching up the Wikipedia links to Ellora caves once that happens. Every single EC post will link there, too. I can honestly say I could care less about English usage. Forget the could/couldn’t problem for a minute. In that same exchange, she used “conscious” when she meant “conscience”. Oh, point. I noticed that when I first read it, but didn’t catch it the second time through. Thanks! Is it just me, or does anyone else think it’s ironic that the Nut was actually behind every action it accused DA of? DA can prove it, and speaking as someone else she’s targeted, so can I. Judge Adams is an intelligent man — you don’t get to be a US District judge without a thorough understanding of the law and the ability to be impartial. I find it impossible to believe that he won’t see through this latest stunt. This is one reason I’ve told the Mouthy Mockernut, “Look in the mirror, TinaNut,” a few times. It’s pretty obvious that PubNT, irrespective of whether he/she/they/it include a ‘legal blogger’ or not, has/have basically no understanding whatsoever of legal issues. To be honest, most of PubNT’s critics are only a little better clued in that department. Otherwise, we’d have seen less hand-wringing over the STGRB flummery, which is eye-rollingly irrelevant to the case. I’m only daydreaming about this, and not volunteering, but it’d be great if the PubNT oeuvre could be mined to identify the questions of law and faux questions of law cited therein, and comment on each of them in the way that Chilling Effects does and GrokLaw used to. Unfortunately, education of the general public on basics of law pretty much doesn’t happen at all in our society, which is why the most amazing idiocy on legal issues is almost omnipresent on the Internet. I’m not sure I want to personally be the one to push that boulder up the mountain, but it sure would be nice to make a start at it. Speaking of the Twitter exchange between TE and Courtney Milan, I can’t help but think that it’s very telling that TE/Jaid Black has never spoken out against pubnt. While she has claimed she isn’t behind pubnt, she has never–at least not that I’ve seen–asked the account to stop its vitriolic attacks on readers and writers. I am an EC author, and I am incredibly disgusted at the lack of professionalism that has been exhibited by TE/JB since this entire fiasco began. I am also a business owner in my own right, and if someone were publicly behaving as abominably as pubnt is and making claims about my company as though it represented me (its ridiculous “not associated with EC” claims aside) I would be the first one to put a stop to it. I don’t particularly like DA or Jane Litte–she was very dismissive of me when I requested a review years ago, so I certainly am not predisposed to any bias in favor of DA. But the pubnt account has, in my opinion, been far more damaging to EC’s reputation than the DA article. Everyone assumes pubnt is somehow involved with EC, and it is publicly bashing and insulting many readers and writers each day. And yet, instead of addressing this, JB attacks Milan and Angela James. I can’t help but wonder why. And I forgot to mention the way it has bashed former EC editors, even referring to one of them as a begger. The pubnt account is a PR nightmare for EC, and yet they do nothing about it. You would think EC would be happy to discover who this awful person is and put a stop to their ceaseless harassment of others. At this point I think TE is more interested in lashing out than in protecting her company. In her defense, every time she’s tried to deflect criticism in the last fourteen years by either having a made-up health crisis or filing a lawsuit, it’s worked. I think she just doesn’t know what to do at this point, since her usual tactics have failed. It’s obvious she a) never thought DA/Jane would fight back, and b) that she’s willing to destroy what’s left of her business with this lawsuit and the ill will it is creating. I’m just glad that there’s a train wreck that I seemingly avoided. There are a lot of good authors whose careers are caught up in this. I have never understood lashing out as a defense. I get that it happens. I just don’t understand it. Does that mean I’m not occasionally vile when I’m cornered? Of course I am. I’m human. But I stop lashing out. For me, I’ve always wanted to spend more energy in setting up the next thing than grieving over the thing that no longer can be. Yes, calling the former EC editor a beggar (and not having TE/JB speak out against that) was particularly telling about the character of EC, its principals, and the EC supporters. It was shameful. And also, just realized I misspelled beggar. Blowing off too much steam! I really feel that people with a platform need to gently guide the way conversations about them should go when they get too far off track or could go that way. For example, I really respect when John Scalzi links to a negative review of his works and tells people not to pile on. Obviously, one’s fans will do what they will, but I think setting expectations is important. I agree with you that it’s fairly telling that TE/JB has never spoken out against @pubnt is telling, but then I believe that TE/JB is the main voice of the Mouthy Mockernut. After all, Twitter fights are far more visceral and immediate than lawsuits. Up until this point, I wanted to believe TE/JB was not associated with the nut, but the mud slinging at Courtney Milan coupled with the lack of response to the nut can only mean one thing. There is really no other rational way a business owner who obviously reads every blog and tweet related to her company would remain silent about the nut. I’m reminded of the saying: Silence is Complicity. I wonder if the Nut failed to notice this part of the document? requests, notices, or inquiries are NOT appropriate. If our dear legume (hat tip Courtney Milan) is who I think it is, then this is easily explained: laws and rules apply equally…to other people. When she’s the subject, things are special. I just hope the judge has some extra special sauce for that special. Weird. My earlier reply never showed up. 🙁 I see it in my comments on the admin portal. Anyhow: @pubnt is technically neither a party nor counsel at present. If it turns out that she is TE/JB or someone affiliated with EC/JJ, though, I’m not sure what the rule of law is about a principal of a corporation vs. their individual actions. I’m sure it’s a well-settled point, though. As a reader who has spent hundreds on books, ebooks, and conventions, supporting my favorite authors, I cannot support a company engaged , in what I believe, a SLAPP suit. With all erosion of our our rights and privacy since 9/11, the Snowden leak, etc. I firmly believe we should have and maintain our right to free speech. I’m voting with my pocketbook on this one. If EC cannot publicly decry the behavior of the nut, it shows such a lack of common sense, to me. IF they ever start working on damage control and show a real turnaround, maybe I can buy from them again, but it is such a shame because I had been shopping quite a bit there filling in my backlist. But this may be a pipe dream, and such a shame for the authors currently with the publisher. Thank you for your comment. Unfortunately, I don’t think that’s going to happen. I agree that it’s a shame for the authors, but hopefully they’ve been working on other revenue sources in recent months.